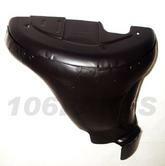 A Brand New Genuine original Peugeot 106 GTi exhaust manifold cover. This protective metal cover, fits over the exhaust manifold at the front of the engine and reduces heat into the engine bay from the manifold. Very common for these to get damaged or go missing. These are listed for the following 106 models: PEUGEOT 106 GTi 1.6 16v all models 96>. Part Description: A Brand New Genuine original Peugeot 106 GTi exhaust manifold cover. This protective metal cover, fits over the exhaust manifold at the front of the engine and reduces heat into the engine bay from the manifold. Very common for these to get damaged or go missing. These are listed for the following 106 models: PEUGEOT 106 GTi 1.6 16v all models 96>.